An amanuensis is a person employed to write what another dictates or to copy what has been written by another. I recently wrote about my distant cousin Alphonse Grozelle (aka Alphonso Grozell); see Alphonse Grozelle (1854-1921). Today, I look at his last will and testament. 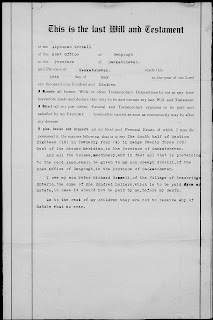 It is rare that I find wills for my ancestors or relatives, so I was pleased to come across Alphonse’s will at FamilySearch.org last week. The digitised probate packet wasn’t large (it consisted of 40 images) and the documents weren’t complicated. 1. 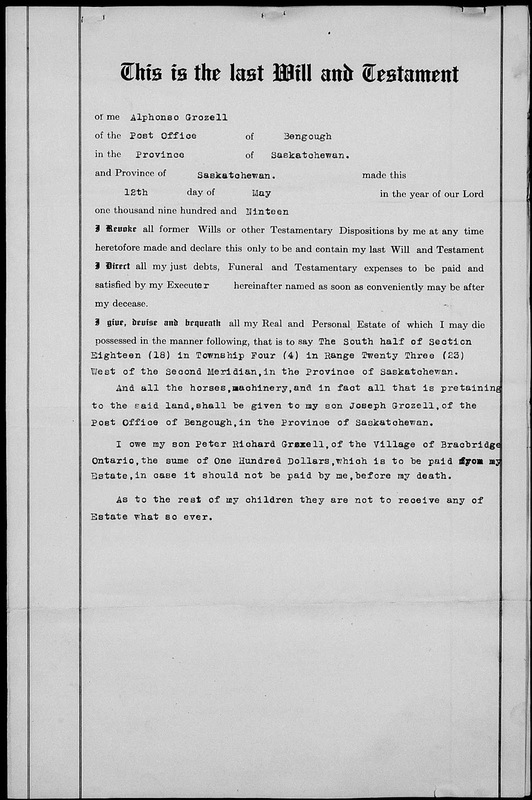 "Saskatchewan Probate Estate Files, 1887-1931," digital images, FamilySearch.org (https://familysearch.org/ark:/61903/1:1:VNTN-FJT : accessed 3 October 2016), Alphonso Grozell [sic], 1921, probate file, no. 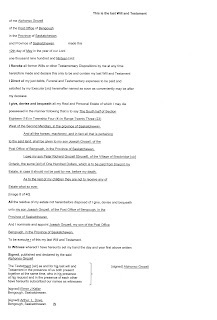 0648, “Petition For Probate” (image 3 of 40); citing Saskatchewan Estevan, Queen's Bench Provincial Court, Regina; GS film no. 1,220,692. 2. 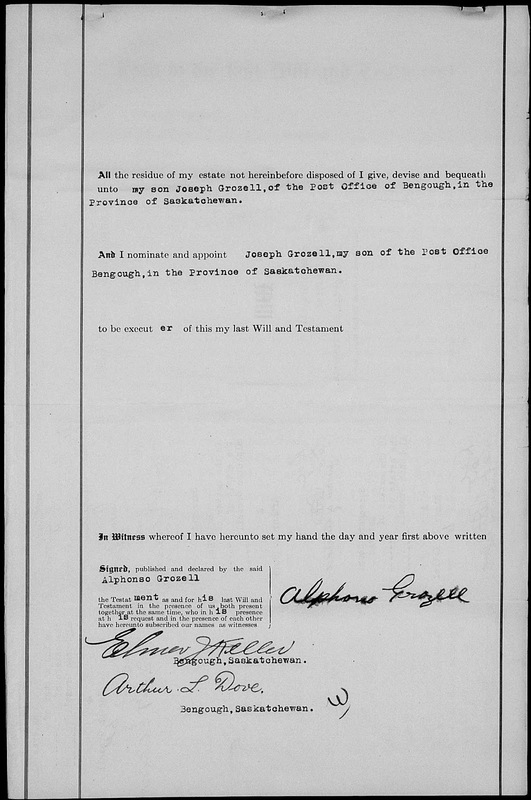 "Saskatchewan Probate Estate Files, 1887-1931," digital images, FamilySearch.org (https://familysearch.org/ark:/61903/1:1:VNTN-FJT : accessed 3 October 2016), Alphonso Grozell [sic], 1921, probate file, no. 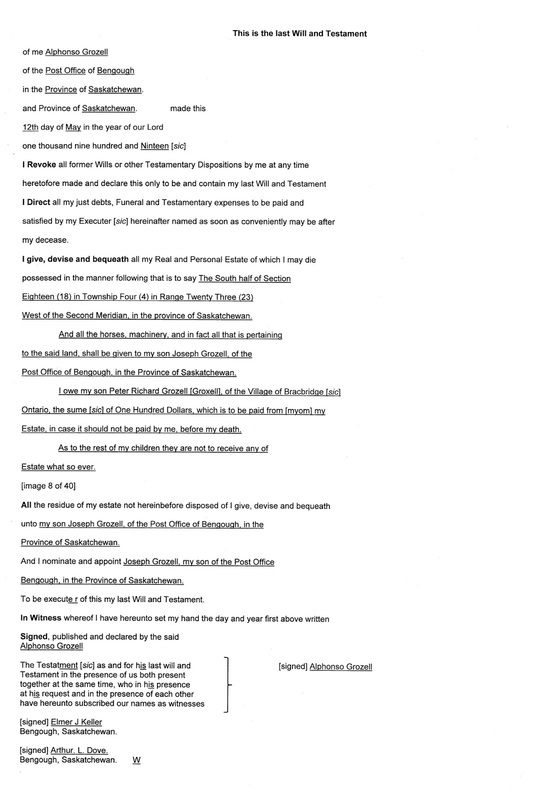 0648, “Last Will and Testament of Alphonso Grozell” (images 7-8 of 40); citing Saskatchewan Estevan, Queen's Bench Provincial Court, Regina; GS film no. 1,220,692. 3. 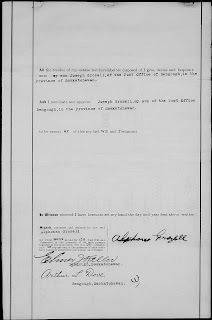 "Saskatchewan Probate Estate Files, 1887-1931," digital images, FamilySearch.org (https://familysearch.org/ark:/61903/1:1:VNTN-FJT : accessed 3 October 2016), Alphonso Grozell [sic], 1921, probate file, no. 0648, “In The Surrogate Court of […]” (image 33 of 40); citing Saskatchewan Estevan, Queen's Bench Provincial Court, Regina; GS film no. 1,220,692. Read last week's interesting post about Alphonso and now this week's post. I wonder: Did he leave nothing to the other children because the eldest was taking care of them and needed the estate to keep the family going? That's a good question, Marian. I'm not sure why Alphonso didn't leave anything to his other children (other than younger child Joseph, who got his father's land). I wonder if there was some disagreement among the family?